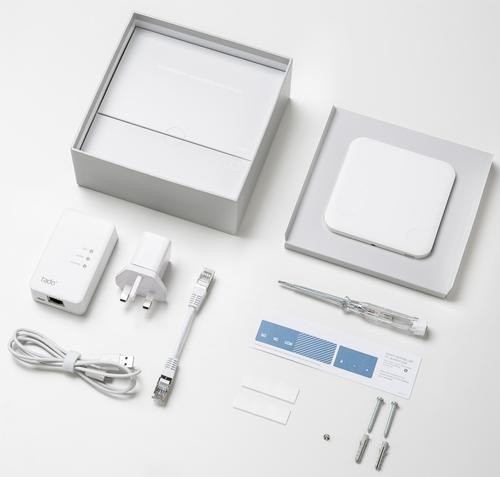 Tado's minimal looks belie some sophisticated technology, but much of the installation is good old-fashioned rewiring. Once you decided whether to buy one of the new smart thermostats you need to decide how competent a DIYer you are. If your talents end with changing a fuse and rewiring a plug we recommend you pay the extra £50 to get an engineer to do everything for you. That £50 is probably a wise investment for most home users, especially if you don't already have a room thermostat. Tado itself "strong recommends" an engineer installation. 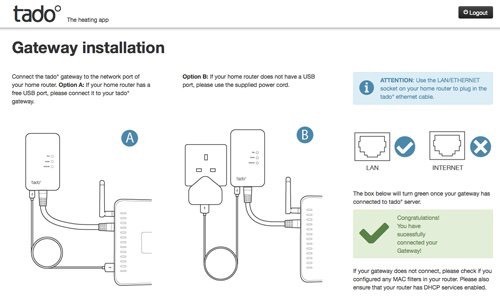 Clear and concise online instructions guide you through the multi-part installation process. If you have a wired thermostat you simply replace your old thermostat with the £199 Tado Smart Thermostat. Any type of thermostat can be replaced, whether digital, analogue or relay controlled. 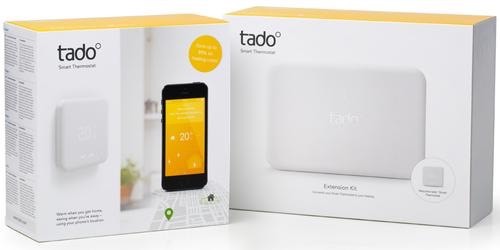 If you don’t have a wired thermostat you will need the £79 Tado Extension Kit to connect to your heating; you also need the Smart Thermostat. The Tado Smart Thermostat controls the heating when wired to the heating system. The Extension Kit controls the heating based on sensor data from the Tado Smart Thermostat. The Tado acts as a sensor and remote control when installed in combination with the Extension Box. You place the Smart Thermostat in the living room – it's battery powered so doesn't need a power connection– and the Extension Box connected to your boiler via cable and placed next to it. The two devices connect wirelessly. 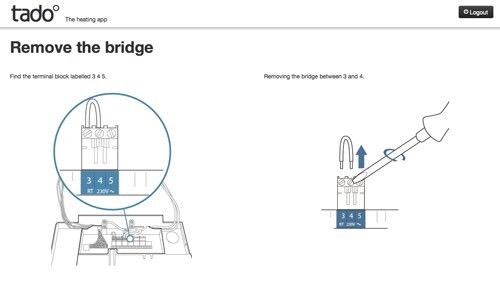 The Extension Kit consists of the Extension Box, the cable to connect it to the boiler and plugs for different boilers. If you have a programmer attached to your boiler to control hot water production, the Extension Kit can replace it. The Extension Box fits the UK standard backplate, so it's easy to replace the programmer without any rewiring. That said, we were mighty glad we had the installer there to do it all for us. In addition there's a Tado Gateway that connects to your router or home network, via Ethernet cable. We found placing the Gateway near to the Tado box helped connectivity, and for that we set up a simple Powerline home network. See Best Powwerline adapters. 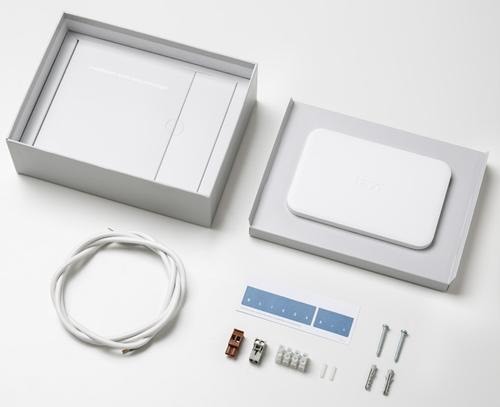 The final part of the Tado installation is connecting the dongle-like Tado gateway to the internet by plugging it into your broadband router. Tado claims that installing the system is “easy to do in just a few simple steps”. We’re less sure of that, especially if you don't have an existing room thermostat on the wall. We’ve talked to a few heating engineers and they all recommended an expert install any of these smart heating systems. Of course they would say that, wouldn't they, but I had an engineer install mine and I’m glad that I did as there were parts of the job that would have had me concerned. If you’re a very competent DIYer this may well be within your skillset. I’m man enough to admit that it would have worried me on more than one of the above actions. See below for what needed doing to wire the Tado box to the electrics inside my boiler. Note though that my house didn’t have an existing room thermostat so the boiler needed more wiring – to take over the boiler’s clock timer – than it would have done if it did. 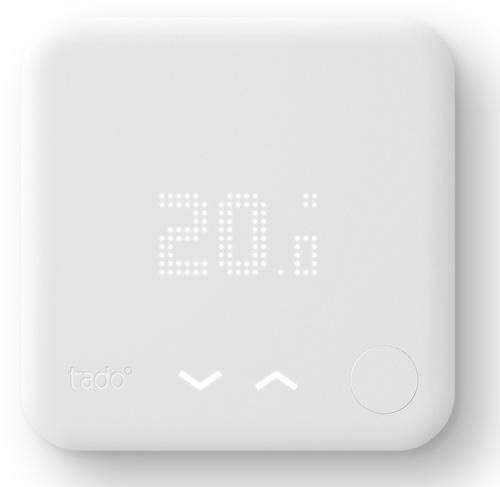 In most of the heating setups in the UK the thermostat can be replaced by the Tado box, which is far less complicated. 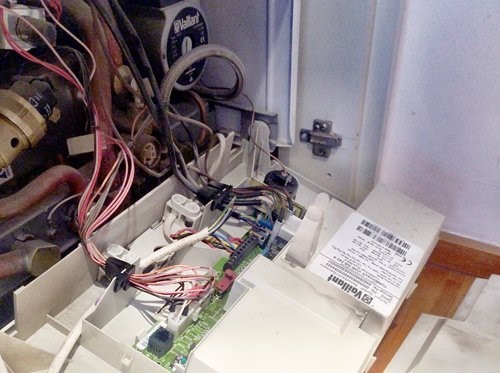 If you have a wireless thermostat or no room thermostat the box has to be connected directly to the boiler, as above. I've heard of plenty of people who have installed the Tado on their own with ease, so it all depends on your level of electrical and boiler-rewiring DIY confidence, and your current setup. Warning: some room stats have permanent live voltage – if you’re not sure if yours does, again I’d recommend spending the £50 on the engineer’s visit. To be fair to Tado this is not unique to its system. A Nest engineer also warned us against self-install, and Nest itself "highly recommends" a full professional installation. There are three installation options: either you self install following Tado’s very straight-forward step-by-step instructions; you self-install with the help of a Tado representative over the phone; or you get an engineer round to do it all for you. Once installed, however, using the apps to control Tado settings and times is pretty simple. The Tado system costs £199 (plus £9.80 shipping), including VAT. Installation by a qualified engineer costs an extra £50, raising the total price to £258.80 if you don’t want to install the system yourself. Tado looks a little pricey compared to the glossier Nest Learning Thermostat, which costs from £179 for the self-install version and £249 including installation, although Nest strongly recommends the more expensive professional install. If you’re skeptical there is another rental option. There’s a monthly fee – charged annually in one amount – of £4.99 (12 months x £4.99 = £59.88). Households that don’t have an existing room thermostat can use the Extension Kit to set up a wireless connection to their heating system. The Extension Kit is available as an accessory to buy for £79 or rent for £2.99 a month. Tado says that the system is compatible with boilers from the major manufacturers, including Vaillant, Worcester, Honetwell, Potterton, British Gas, Ariston, Buderus, Siemens, Wolf, Junkers, Drayton, Ideal, Danfoss, Baxi, Glow-worm, and more. Update: Tado has announced a new service called Tado Care, designed to prevent heating system breakdowns and offering immediate help in case of malfunctions. As part of the new service a remote and free of charge boiler check is offered to all Tado customers every year in late summer. This check runs in the background and Tado sends a push notification via its app to assure that everything is working properly before the colder winter season starts. A digital interface enables Tado Care to detect errors and maintenance requirements well in advance. It monitors the performance of the heating system and sends the user a message if action is required. For example, if the water pressure is too low Tado will inform the customer in the mobile app news feed and will suggest self-help actions or connect him or her directly to an engineer if required. Tado is partnering with large installer networks such as HomeServe plc to offer immediate on the ground support. Although time will tell how much energy/money Tado has saved me it’s clear that having control over a house’s heating determined by who is in the house and who isn’t makes a lot of sense. Tado is the best smart thermostat at this as its presence detection simply follows you and your smartphone via GPS, and turns the heating up or down as you get further away or nearer home. Most of us just set the timer and only go back to the boiler to flick it on or off when we get too hot or cold. Being able to control this (wherever you are) via an app on your phone is a much more intelligent way to control your heating and energy costs. The initial cost isn’t cheap, but there is a money-back monthly payment option, and you should start saving on your heating bills within a few days.